WordPress as we know it is a very powerful software for better content creation. Normally, WordPress would automatically create an optimised website for you despite the type of theme you use. Normally, if you are just creating your blog and you suddenly notice within few hours to days, you start appearing on the Google, Yahoo or Bing search engine result apparently after you search for yourself by entering your own website name, then its as a result of the software…Wordpress. Ranking on search engine takes some skills and some extra lengths of optimization. This way your blog dont get hiiden from the rest of the entire world. WordPress which makes the job easier with lots of plugins that helps get the job done without any sweat. Now this case, we’ll be dealing with one of the most spectacular which is the Yoast SEO plugin. Yoast actually had established itself as the trusted plugin for easier optimization plugin for wordpress users and bloggers in general. This plugin allows the optimization and editing of your blog post title, meta description and even the focus keywords which are the most important part of the entire job. Ranking for a keyword demands some lots of research works which makes your website get a better and improved traffic. But before we dive totally into how important the Yoast plugin is and how it works, lets start by asking ourselves the question…. How do I Rank better on Google? How then do you create the relevant content? To create a relevant content depends on your nitche. Now in any way, you might want to some use keyword research plugins and addons in order to get a better glimpse on what to write and how to write them. What this means is that you need the best content for your nitche in order to rank better for those keywords. Let me make this clearer by giving an example of someone who wants to write about “Best Suede jackets for summer outing” and in his posts have contents which arent relevant to the topic. This way, if the Google crawler tries crawling and realises that those words doesn’t rhyme up with the keyword being searched, then there might be some problem for ranking. Well, thats somehow simple. To have the best contents demands time, demands researches and relevance. So using keyword research tools helps to do the job quiet better. Relevant contents are original contents: Google’s new update of its Panda algorithm tackles and deals with contents which are not original. It avoid duplicated contents. This means when you simply copy another post from another website (Could be your other website on your new website’s blog) then it might hurt your chance of ever ranking top and in fact might get you penalized. So avoid this practises. Creating good, long and helpful contents: This is another help tips. How this helps is that when you share your posts around, it gets a link back to you and this helps your link building. Other authors with powerful traffics might refer to your blog and this linking helps your ranking. Just in case you dont know, you need bunch of relevant links into your posts to help it rank better. Optimize with images too: Eye catching images help you get better attentions from readers as images narrates better what you are explaining. So in this case, you might want to utilise good images with ALT tags and captions. So your images ranks too when users search for your contents. You can apply for Google news: Yoast also have a premium tool that help you maintain your relationship while accepted into the Google News. This helps you get better link back. Use Videos and Youtube too: This is another tip and free traffic channel. Make a video part of your tutorial so that your users can get better glimpse about what you are talking about. You can build your subscribers from there and then have some decent traffic on daily basis without any stress. Now with those two issues tackled, its time to proceed back into wordpress yoast SEO tool. This plugin as we know allows for better search engine optimization. Though it comes in two forms. The free and the paid version. Both work brilliantly and do the job quiet well. So then, lets work out how to use this plugin then. There are some advantages to using the plugin. The .HTAccess: This is a very important file within your WordPress isnatll. What it does is simply telling a search engine Crawler, Bot or Spider what to search, how often it should search and where not to search. If this type of file isn’t well written , it might affect how search engine bots crawl and index your website. This range from prolonged crawl time to other errors. But the plugin gives you a handy editor in which you can easily edit the .HTAccess file for better optimization. XML Sitemaps: In case you have been worrying about where to get this, the Yoast SEO tool gets that covered. This is a very essential tool part for your SEO ranking since if submitted, it allows for easier crawling by search engine robots. All to be done is enable it in the settings page and as quick as possible, this gets done without any hassle. But there are thousands of advantages having a powerful and self updating sitemap. It helps your SEO alot. Permalinks: Naturally, WordPress does get this covered in some extent. This means that you need not to worry about getting any rough numbers with some PHP code tags as your post URL anymore. This way, you can actually edit the permalinks that leads into your blog post. This is a very important tool for ranking better. What Google or any other search engine does look for are Relevant keywords, matching contents and relevance to the keywords used, the Permalinks, the meta description an the Title. Breadcrumbs: This is another good head for wordpress yoast seo tool for better ranking. Is not that this would help you rank higher but what it does is create an easier to navigate link from your blog home to that particular content. Am sure you know what am trying to talk about. This is a very an addition and it makes sense in the face of search engine users and your content’s appearance on the search results wont look too busy but clean and neat. Robot Meta Configuration: Meta Whether you want to keep a single post or page out of the index, or you prefer to keep entire sections of your site unfindable: the Yoast SEO plugin has your back. Hidden by default under the “advanced” button is a meta robots settings block that allows you to choose any setting you want on a per page basis. 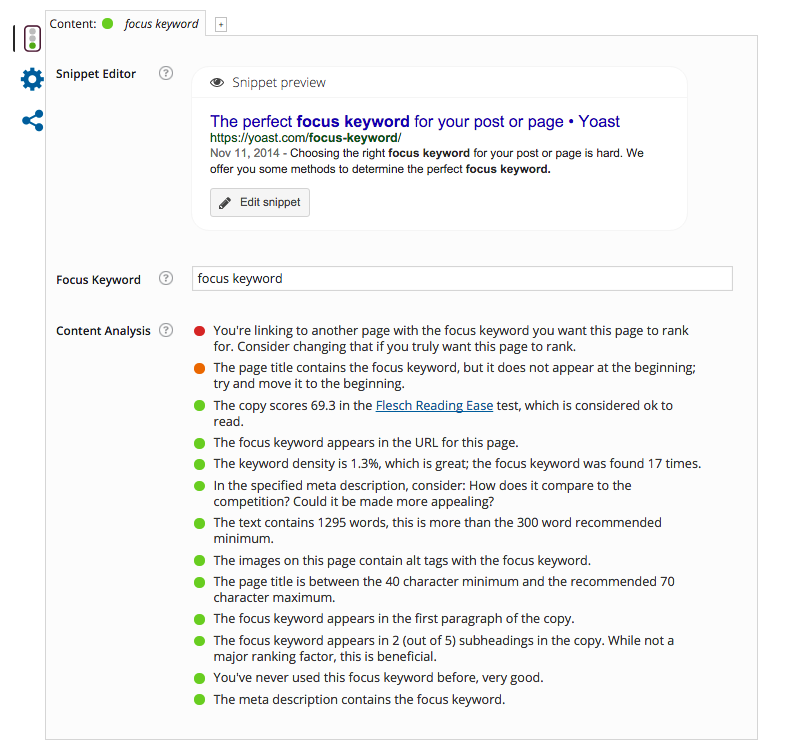 Focus Keywords: This is another powerful function of the Yoast SEO tool for wordpress. What it does is help you gather your bunch of keywords and then get them stuffed together up in one place. What this means is that after you must’ve made keyword researches and get related keywords, you then input them up in this field and then the plugin helps search for its relevance within your own post and it gives you a result maybe it is good, normal or bad. So you start knowing what’s up right with your WordPress admin panel. Canonical: Since it’s introduction by Google, this helps in a way of keeping apart original posts from derivative posts. So this distances helps Googlebot realise which of your content is original in order to avoid duplicate contents which could hurt your SERP ranking. Pages/Category Meta descriptions: Now as easier as possible, you can allow your pages, post categories and Tags to all get indexed with better keyword focus and editing with the Plugin. This plugin creates below this pages an easy to manage meta box for easy editing. All that said, it just as simple as installing another plugin in your wordpress website and then get it activated. It produces a menu which you make all the settings you want. Using the wordpress Yoast SEO tool is very straightforward and easy to understand. This gets you more familiar with the Google and other search engine optimization. Its as simple as that.